Yes, that’s right. It costs these multi-national gas/frack companies just $300 to apply for a frack well permit. But when Ban Michigan Fracking asked the Michigan DEQ for copies of documents so that the public can find out what happened in the 40,068-gallon frack fluid disaster spread out on roadways, in a Freedom of Information Act request, DEQ asked us to cough up $476. Would you like to know what happened to all that frack waste? We would and we’d like to provide the documents to the public. Please help us by donating to Ban Michigan Fracking today and help us uncover some of the facts. Last week, Ban Michigan Fracking reported the 40,000+ gallon frack fluid disaster to the National Response Center operated by the US Coast Guard, and also to the Environmental Protection Agency. See our Report to EPA and our incident report to the National Response Center. All correspondence and reports, field notes, photographs, site evaluations and other materials including emails and phone notes between, to or from members of either department and all other parties including but not limited to: corporations, persons, governmental entities or departments, road commissions, the EPA, other Michigan state employees or elected officials, first responder units and public health authorities regarding the frack fluids at the Excelsior 1-25 HD1 well during the period commencing with the approval of the well’s permit to today’s date, September 13, 2012. Records regarding the quantity of frack fluids removed from the well between May 14 and June 13, 2012. Records showing the quantities of brine/flowback and locations in the state in which this brine/flowback was stored, received, and used (ie, flowback materials) for application on roads, approval of which was granted by DEQ and then revoked. All records and correspondence regarding cleanup activities DEQ has done to remediate areas that received the flowback from Excelsior 1-25 HD1. All MSDW [sic] sheets regarding this well. Please inform me of any and all costs of this FOIA request prior to making electronic copies. I request that charges be waived because our organization is acting in the public interest. The DEQ’s charges for the FOIA? Attorney Ellis Boal filed the appeal on behalf of plaintiffs Deanna Hughes and Heather Schiele, residents who were threatened by a Devon Energy well in Gladwin County, and Ban Michigan Fracking on October 16, 2012. See an earlier post about the lawsuit here. The case began in April when plaintiffs filed an administrative petition to the DEQ asking for a declaration that every frack well, whether vertical or horizontal, is an “injection well,” as that term is defined and as frack wells are defined by the DEQ itself. One would think so, since a frack operator injects huge amounts of water and chemicals into each well, and a significant part of it remains disposed in the frack well. The legal definition of “injection well” includes “a well used to inject water, gas, air, brine, or other fluids for the purpose of increasing the ultimate recovery of hydrocarbons from a reservoir…. ” It also includes disposal wells. All facts in the case are uncontested. Before filing, plaintiffs went to several industry experts, including one who is the American Petroleum Institute’s top expert, with the DEQ present. Without hesitation the experts confirmed that a frack well fits the DEQ wording of an injection well. One result of a DEQ declaration would be that certain of the chemicals injected would have to be disclosed before drilling starts, which would make baseline water testing by nearby landowners easier and cheaper. Another would be restrictions on the fracking process itself, including a limit on the pressure. The industry was invited to participate in the case. It declined, preferring to let the DEQ carry the ball. The DEQ sat on the petition beyond the rules’ 60-day time limit, after which DEQ director Dan Wyant wrote, rejecting plaintiffs’ position. Plaintiffs sued. The judge deferred to Wyant’s ruling. 1. Whether a court should discard the deference it traditionally accords to an agency’s interpretation of its rules, when the agency refused to abide by its own time limit. 2. Whether under the facts above the court declare that a frack well is an injection well. Part of the suit was to rescind DEQ frack permits issued since April when the petition was first filed. Specifically the suit tried to stop two of Encana’s giant wells on Sunset Trail in Kalkaska County in the Mackinaw State Forest, one of which recently set a state record for depth. The case of the Sunset Trail wells will be moot by whenever the court of appeals rules. But if it rules favorably, any frack permits pending at the time will be automatically in violation. Michigan does not have a Halliburton loophole in its rules. But the DEQ has fashioned one anyway, which it is not allowed to do. Ban Michigan Fracking is for a fracking ban, not simply better regulations. But the suit puts the agency on the run by exposing how it has bent over backward to protect the industry, which won’t protect itself, instead of the public. Frack wells are indeed injection wells, injecting millions of gallons of fluids and for permanent disposal for some of that frack waste. We see the problem of fracking and the tremendous amounts of frack wastes it produces clearly, particularly in the ongoing episode of the 954 barrels (that’s 40,000+ gallons, or nearly two tanker cars!) of frack flowback wastes recently spewed onto Michigan roads as permitted by the DEQ this past May and June. That frack flowback waste came from two Encana horizontal frack wells in the Mackinaw State Forest. And how do people living near frack wells stand a chance against an agency like the DEQ? We need to BAN FRACKING and expose this entire fascade of “regulations” that “protect” us. 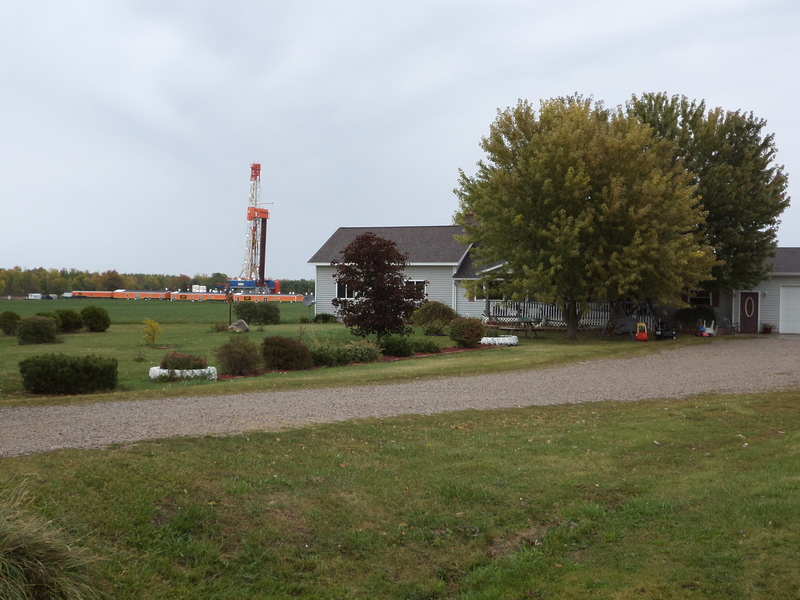 A deep horizontal frack well in a backyard in Ogemaw County. Photo by LuAnne Kozma. Copyright 2012 by Ban Michigan Fracking.